1. Preheat oven to 350 degrees. 2. Combine cream cheese, cheddar cheese and scallions in medium bowl. 3. Combine panko, paprika, chili powder, garlic powder, salt and pepper in another bowl. 4. 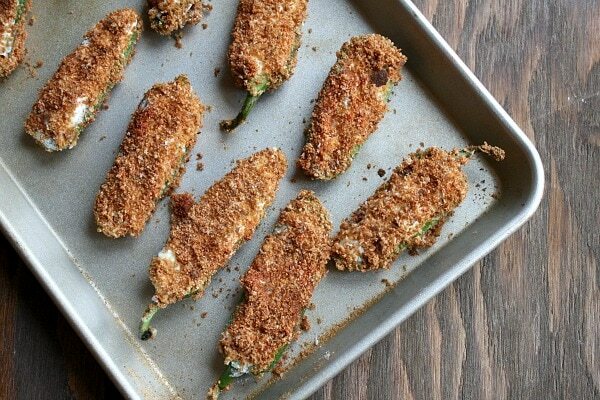 Fill peppers with cheese filling, dip in egg beaters, then place in panko crumb mix using a spoon to coat. 5. Line a baking sheet with parchment paper or cooking spray. Lightly spray peppers with cooking spray. 6. Bake 20-25 minutes until golden-brown.